Several districts across Greater London, Greater Manchester, Merseyside, West Midlands, East Midlands, West Yorkshire, Bristol and several other areas. In early August 2011, England was struck by riots, the worst in the country in decades. The timeline of the events of the riots spanned from 6–10 August. On 6 August, an initially peaceful protest was held, beginning at Broadwater Farm and finishing at Tottenham police station. The protest was organised by friends and relatives of Mark Duggan (who was killed by police on 4 August 2011), to assert a perceived unmet need for justice for the family. The rioting occurred shortly after about 120 people marched from Broadwater Farm to Tottenham Police Station via the High Road. The group demanded that a senior local police officer speak to them. They stayed in front of the police station hours longer than originally planned because they were not satisfied with the seniority of the officers available at the time. A younger and more aggressive crowd arrived around dusk, some of whom were armed. Violence broke out following a rumour that police had attacked a 16-year-old girl. A series of disturbances by people in Tottenham followed the protest march on 6 August. The rioting occurred shortly after about 120 people marched from Broadwater to Tottenham Police Station via the High Road. 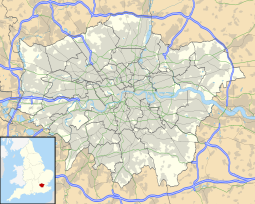 Tottenham is in the London borough of Haringey, which has the fourth highest level of child poverty in London and 8.8% unemployment. At 22:15, a gang of youths burned down Tottenham's post office. From around 22:30, attacks were carried out on police cars, a double-decker bus and local businesses and homes. Police vans and officers from the Territorial Support Group attended the disorder on Tottenham High Road. Shops windows were smashed and the shops looted by rioters. Fireworks, petrol bombs and other missiles were thrown at police. Twenty-six officers were injured, including one who sustained head injuries. Firefighters experienced difficulty reaching a burning building because of the disorder. A BBC News correspondent said his news crew and vehicle came under attack from youths throwing missiles. Some news crews left the scene due to the threat of violence. A Mail on Sunday photographer was beaten and mugged. The police set up a cordon around Tottenham police station and a nearby group of BBC and Sky journalists. Some of the police were on horseback. The violent clashes were followed by the looting of Tottenham Hale retail park, which continued until dawn without police intervention. London Ambulance Service confirmed that ten people had been treated for injuries and that nine were in hospital. On Sunday evening, 7 August, violent disturbances erupted in Enfield, to the north of Tottenham, among a heavy presence of riot police. Enfield Town centre, Enfield Town Park and alleyways between there and the Palace Garden shopping centre were guarded by police. A heavy police presence was seen outside Enfield Town railway station where people arriving were being searched for security reasons. Riot police arrived in Enfield Town the afternoon of 7 August as several small groups of hooded youngsters arrived in cars, buses and trains. Around 100 people were waiting in small groups in the vicinity of Enfield Town station in Southbury Road. Disorder ensued around 5:30 when a police car in Church Street was pelted with bricks. Shops were attacked, including HMV's branch in Church Street. A police helicopter hovered over the area. At around 19:00, police pushed a group of around thirty youths back onto Southbury Road towards the junction with Great Cambridge Road. Police dogs were deployed at the scene. Similar action drove back approximately 50 people along Southbury Road via Queens Street, after a preceding clash with rioters outside a supermarket. At 19:30, both Metropolitan Police officers and reinforcements from Kent Police cordoned off Enfield, making a "sterile area" to deal with local disturbances, including robberies at Enfield Retail Park. The scenes of Enfield were "reminiscent of Tottenham, though smaller." Looting spread to Brixton that evening. Six fire engines fought a blaze at a Foot Locker shoe shop in Brixton. Riot police and youths clashed near a local Currys store that was broken into during the disturbances. Speaking to The Daily Telegraph, a local resident described "hundreds" of men and women entering the electrical shop and emerging with TVs and other electrical goods. When police arrived, the looters attacked, throwing rocks and the contents of rubbish bins at officers. A branch of Halfords was targeted and looted by youths. One Brixton resident said: "People were coming to Brixton from outside the area. I was getting out of Brixton Tube last night about 22:30 and going up the escalator when about 10 teenagers ran up the escalator and pushed me to one side." By 11:57, both Tesco and Foot Locker were targeted by looters. Lambeth Council's leader, Councillor Steve Reed said of the mobs in Streatham, "They were looters not rioters." Disorder broke out in Wood Green, two miles (3 km) from Tottenham, during the early hours of 7 August. Widespread looting involved around 100 youths who targeted high-street game shops, electrical shops and clothing chains. Others ransacked local shops on Wood Green High Road. A family-run jeweller was hit. By 20:00, major rioting had spread to Wood Green, with riot police on hand. Again, the police did not intervene to stop the looting. The mostly Turkish and Kurdish shop owners along Wood Green, Turnpike Lane and Green Lanes, Harringay, formed local 'protection units' around their shops. Dalston: Looting hit Kingsland shopping centre in Dalston, including JD Sports and Foot Locker. Denmark Hill: A gangland fight broke out at King's College Hospital at about 20:30, where two victims of a minor stabbing had been admitted earlier. Islington: The windscreen of a police vehicle was smashed as groups of youths caused a disturbance. Leyton: Looting occurred at Currys in Leyton Mills retail park and the bicycle shop Bike Shack. Oxford Circus: Overnight, violence spread to Oxford Circus, central London, as about 50 youths gathered and damaged property. Shepherd's Bush: The police skirmished on the Edward Wood Estate in Shepherd's Bush, while a shop was looted in King's Road. Streatham: A T-Mobile shop, JD Sports and other shops were ransacked. Councillor Mark Bennett said the owner of one shop in Streatham High Road was hospitalised after a mob attacked the shop. Woolwich: In Woolwich town centre local shops were looted and set on fire, including the Great Harry Pub, which later became the focus of local opinion about the events and was featured on Sky News after locals began writing their thoughts and messages on the boarded-up shell. Many locals felt that news coverage neglected the Woolwich events. Waltham Cross, Hertfordshire: Looters and rioters attacked two police cars and two jewellers in Waltham Cross High Street at around 21:50. A specialist public order unit was sent to the area, along with sections of the Bedfordshire and Hertfordshire Police Dog Unit. On 7 August, riots led to the cancellation of the Hackney One Carnival and Parks for Life Festival in Clissold Park, Stoke Newington. Operation Withern was launched to investigate the cause of Mark Duggan's fatal shooting and the subsequent riots. According to a statement by the Metropolitan Police Service, Operation Withern was being led by Detective Superintendent John Sweeney of the Metropolitan Police Service, and is made up of detectives from the Homicide and Serious Crime Command, specialist investigators from the Public Order Branch and police support staff. The MP for Brent North, Barry Gardiner, said that community involvement there had so far prevented riots. The Mayor Of London, Boris Johnson, revealed that he had provided an extra £42,000,000 to the Metropolitan Police during the previous year to increase police numbers in London. Officers from North Yorkshire Police responded to the request to assist their colleagues in London. By 07:59, the Metropolitan Police Commander Christine Jones said: "This is a challenging situation with small pockets of violence, looting and disorder breaking out on a number of boroughs." Jewellery shops across Tottenham, Enfield and Wood Green suffered break-ins. The Victoria line was closed between Stockwell and Brixton "due to civil unrest", according to London Underground. Angel, Islington, Stoke Newington and Wood Green were in police lockdown. All 32 boroughs of London were placed on riot alert. Police closed the entire area around West Croydon station on the evening of 8 August. Bricks, bottles, stones and fireworks were thrown at police. Looted shops included branches of Argos, Iceland, House of Fraser, Orange, Maplin Electronics and Tesco. Purley Way stores Best Buy, PC World and Comet were heavily looted for electronics. Many other small businesses were also affected. A large furniture shop, House of Reeves, which had been in Croydon since 1867, was burned to the ground. Arsonists struck later that night and destroyed another building in the Reeves Corner district of Croydon. A Sky News satellite van came under attack and many shops, cars and buses were set alight in West Croydon. At 19:45, Croydon Advertiser reporter Gareth Davies was mugged while reporting in Surrey Street and Church Street. A 26-year-old man from Brixton, Trevor Ellis, was shot and killed in South Croydon on Warrington Road. Police believe he was shot after a car chase following an argument over stolen goods, but as of August 2012 had not charged any suspects. In February 2012, the Croydon Advertiser reported an investigation was underway following reports that only 3% of the police attended to the riots in Croydon whilst others were deployed elsewhere. Some Ealing businesses were asked by police to close at 5 pm. On Ealing Broadway a group of 200 people attacked police cars and vandalised and looted shops. Around Haven Green, close to Ealing Broadway tube station, cars and a bus were set alight and many other cars vandalised, shops had their windows smashed, a supermarket was looted and nearby residential properties were burgled. Near Ealing Green more shops were looted, several cars torched and a supermarket set alight with petrol bombs. Rioters attempting to vandalise two pubs in this area were dissuaded by the customers and staff. Hundreds of young people looted shops in West Ealing. There was minor trouble in Ealing Green. A 68-year-old man was assaulted and robbed when he tried to remonstrate with rioters. He was taken to hospital with life-threatening injuries, and died three days later. 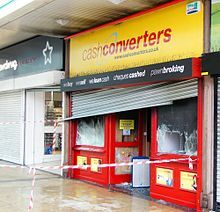 On the morning of 8 August several shops in Enfield Town and in the nearby A10 retail park were vandalised and looted, and two vehicles set ablaze. A large crowd of youths moved westwards, toward nearby Ponders End and wrecked a local Tesco. Hundreds of riot police and canine units arrived with vans and charged at groups of teenagers until they dispersed, smashing cars and shop windows on the way. A large Sony distribution centre was set alight and the fire destroyed the building. Three Watford fire engines were called to the Sony warehouse in Enfield at about 03.30 the next day. Balham: Several shops were looted. Barking: A 20-year-old Malaysian student was beaten and then robbed twice by looters in Barking. He suffered a broken jaw, requiring surgery and a night stay in hospital. Barnet: About 60 people were chased off by riot police after looting shops in Barnet in the night. Minor disturbances occurred at the Brent Cross shopping centre. Battersea: The windows of many shops on Lavender Hill and St. John's Road were smashed, many were looted, and one shop was destroyed by fire. The local Debenhams was looted that night. Bayswater: A mob of around 30 teenagers and adults targeted businesses along Queensway. Shops, including Best One and Maplin as well as Whiteley's Shopping Centre, had their windows smashed. The gang tried to loot some of the businesses but the police repelled them. Queensway and Ladbroke Grove tube stations closed early due to the troubles. Bethnal Green: Running battles with police occurred in Bethnal Green. Camden: Minor overnight disturbances broke out, quelled by police. Catford: Looters broke into several shops in Rushey Green including an independent opticians, Argos, 99p Stores, JD Sports and a Halfords store. Charlton: Police dispersed local riots, but Stone Lake Retail Park shops were looted. Chelsea: Looters broke into an antiques shop in King's Road. Chingford Mount: Three police officers were hospitalised after being hit by a fast-moving vehicle in Chingford Mount, Waltham Forest, at 00:45. The officers had started making arrests after a shop was being looted by youths. Chislehurst: By 11:30, the police had cordoned off Bromley town centre with both the High Street and Bromley South railway station closed after a stand-off with rioters. The stand-off lasted until at least 18:35. Colliers Wood: By 22:12, looting and vandalism hit Colliers Wood retail park until police arrived. A stand-off developed after 21:30 when police withdrew from the Tandem Centre, where the rioters broke into the shops including Sports Direct, JD Sports, PC World and Mothercare. Crystal Palace: At 12:10, a group of Crystal Palace residents united to see off the looters. Dulwich: A Tesco Express shop on East Dulwich Road and shops in Lordship Lane were looted. Fulham: Police made nine arrests as the violence spread to Fulham. The area was cleared by about 1:00 am, with only a smashed window at a Foot Locker shop. Police officers stood guard outside PC World in the Wandsworth Bridge Road business park, as looters threatened to storm in. Hackney: Sporadic skirmishes were reported to have occurred between police and groups of young people around Mare Street. Youths threw bottles, petrol bombs and the contents of rubbish bins. Bins and cars were set on fire and the mounted and riot police charged retreating gangs. Harlesden: Looters targeted a pawnbroker in the evening. Shops were looted in the town centre, as well as a jewellery shop in Harrow Road. Ilford: A jewellery shop was targeted and an electrical shop was broken into. Lines of riot police protected Ilford Police Station. A man was treated by paramedics in Ilford Hill at about 19:30. One eyewitness said that the man was "intentionally" hit by a car, which then drove off. Islington: Sporadic night-time riots occurred. Kingston: Kingston's pubs and clubs shut early, with the Wetherspoons, opposite The Oceana Cub, one of many to shut early at about 22:00 on police advice as the town braced itself. The online rumour that an offshoot of the rioting had got to Kingston's town centre was unfounded. A Twitter report falsely claimed that Kingston's Bentall Centre was a blazing and looted ruin. Ultimately, Kingston suffered no incidents. Lewisham: Sporadic rioting occurred in Lewisham in the evening, but rioters were quickly dispersed by riot police. At 18:35, 15 riot policemen faced down a large group of mainly angry young people in Lee High Road, Lewisham. Police dispersed local riots. Notting Hill: Diners at the two Michelin-starred Ledbury restaurant were attacked and robbed. Peckham: Shops on Rye Lane and Peckham High Street were looted by a crowd of three to four hundred rioters. A bus was set on fire on Southampton Way and Regen's was destroyed by fire. Romford : The windows of many shops and businesses around Romford town centre were smashed, fires were started and Debenhams was looted. Streatham: Sporadic night-time riots occurred. Surrey Quays: Shops in the Surrey Quays shopping centre and a local Decathlon shop were looted by youths. Sutton: Damage was reported to businesses on the High Street and in the Rose Hill area, as well as the looting of a local convenience shop. In Hackbridge there was looting of an off licence and a warehouse. In Sutton Town Centre, shops such as JD Sports, Asda, Argos and HMV were looted, and Asda was set on fire. Tooting: By 18:01, two shops had been attacked: a CeX branch on Mitcham Lane and a Ladbrokes branch on Franciscan Road. Upminster: Police were praised by locals, including one resident who filmed rioters attempting to loot the local Debenhams shop. Walthamstow and Walthamstow Central: Over 30 youths wrecked and looted shops, including a branch of BHS in Walthamstow Central that morning. A Santander branch was broken into and a Barclays cash machine was ripped out of a wall. Walworth Road: Up to 20 shops on the southern end of Walworth Road were broken into from 19:30 and looted for up to an hour. Woolwich: Major disturbances took place overnight. A J D Wetherspoon pub, Blue Inc clothing shop, and a police car were completely burnt out, and a restaurant was set alight. Other buildings along the high street had windows smashed and looted, including jewellers, computer game shops, banks, phone shops, bookmakers and fast food restaurants. Videos appeared online showing outnumbered police fleeing rioters, originally shot by Jellyfielder Studios, a Woolwich-based film production company. This footage was featured on BBC, Sky New, Russia Today, ABC, and later appeared on NBC's Caught on camera, and several Channel 5 Top 20 worst. The Great Harry Pub became the focus of local opinion about the events, and was featured on Sky News after locals began writing their thoughts and messages on the boarded-up shell. The wall was later painted over in black by the local council who refused to comment on why. Many other shops were attacked and looted. 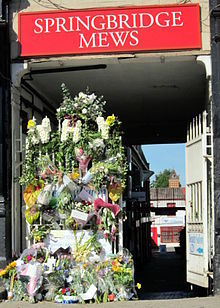 Many locals felt that the Woolwich events were neglected in news coverage. Birmingham: Some shop windows in the city centre were smashed and there were reports of looting in several areas. An unmanned police station in Handsworth was set alight. Police arrested 130. West Bromwich: Youths rioted, looting business, smashing shop windows and setting bins and cars alight. Luton: Police officers were deployed to known trouble spots as Twitter and Facebook reports falsely claimed riots in Luton. Two small arson fires occurred – one at Leagrave Motors in Sundon Park Road, Luton, at around midnight, and a rubbish bin set alight at Arrow Close, also in Luton, in the early hours of the morning. The county of Bedfordshire had a CCTV network in operation across every town to monitor and help deploy resources. Leicester: No fires but shop windows were still smashed. Guildford: Surrey Police condemned Twitter reports of rioting in Guildford, acknowledging only minor scuffles. Leeds: The Chapeltown area was hit by riots, during which 34-year-old Gavin Clarke was shot in the face and admitted to hospital under armed guard with life-threatening injuries. He was later pronounced dead. This account is contradicted by a BBC report which suggests that the disturbance started as a result of the shooting and that the incident was related, not to the troubles in London and elsewhere in England, but to another shooting that took place in Chapeltown on 2 August 2011 - several days before the London shooting. Liverpool: Disturbances occurred in South Liverpool, in particular the area of Toxteth. Medway: Rioters burned cars and confronted the police in Gillingham and Chatham. Norwich: Shops in one of Norwich's main streets and Royal Arcade were closed early after threats filtered through in relation to the unrest in London. Nottingham: A police station was attacked and car tyres were ignited in the St Ann's area. Oxford: A McDonald's restaurant in Headington, Oxford was set alight as was a car in Barton, Oxford. Croydon: The council gave looters a stark warning to stay away from Croydon or face the full force of the law. Deputy Prime Minister Nick Clegg toured London's riot-hit communities in and around Tottenham. North Yorkshire Police continue to monitor the aftermath of the disorder affecting other parts of the country, and we can confirm that to date, there are no reports of any similar incidents in North Yorkshire. The Bedfordshire and Hertfordshire Civil Contingencies and Public Order Planning Unit sent a Police Support Unit (PSU) to London. Custody space in Bedfordshire cells and call taking support was also offered. Floral tributes at the site of the fatal assault. The flowers at the top spell out the word "why". Bowes was a 68-year-old British retired accountant who died as a result of being attacked in the street in Ealing. He was the fifth fatality related to events associated with the riots. He was attacked by a mob on 8 August 2011, while attempting to extinguish an arson fire in industrial bins on Spring Bridge Road. The attack left him in a coma. The assault was caught on CCTV and filmed on mobile phones by associates of the man who hit him. Police officers arrived at 10:45pm in response to reports of looting at the Arcadia shopping centre. They were not wearing protective gear and were outnumbered by approximately 120 rioters. The attack on Bowes was witnessed by several police officers, but they were unable to respond in time. They requested assistance as they were showered with bottles and bricks. Riot squad officers who responded had to push back rioters while being attacked to reach Bowes. A line of officers then held back the rioters as paramedics arrived. Bowes was found without a wallet or phone as they had been stolen, and police initially faced difficulty in identifying him. He died of his injuries in St Mary's Hospital on 11 August 2011 after being removed from life support. A 22-year-old man was arrested on suspicion of murder, rioting and committing three burglaries; he was released on bail. A 16-year-old boy was arrested for Bowes' murder and for burglary. Bowes had moved to Ealing in 1994. He lived alone in a flat in Haven Green. He was described as quiet and shy and a loner. He is reported to have previously challenged anti-social behaviour in the area. On one occasion, ten years earlier, he was fined for confronting youths who were urinating outside his home. Revulsion at Bowes's death was widespread. His local council is considering naming the alleyway where he was attacked after him. Ealing Council flew the Union Flag at half-mast over its town hall as a mark of respect. It also announced that it was launching the Richard Mannington Bowes Relief Fund in his memory. Bowes was hailed as a hero for his actions by the media and politicians. Mayor Johnson was particularly vocal: "I feel desperately sorry and sad for him, and what a hero he is. He walked straight up in front of the looters and tried to stop what was happening. He is an example to everybody." There are many villains in this story but also many heroes and I want to pay particular tribute to Mr Bowes. He has paid a terrible price. Time Magazine wrote "Not since the blitz during World War II have so many fires raged in London so intensely at one time". Looters burned a Sony-owned warehouse in Solar Way, Enfield which acted as the primary distribution hub for the independent music distributor PIAS Entertainment Group. In the morning, youths formed groups of 10 to 12 in areas across Havering, including Romford, Hornchurch, Collier Row, Rainham, Harold Hill and Upminster, a police spokesman said, but officers dispersed groups or issued street warnings and spot deterrents. Arrests took place for low-level crimes like spitting at an officer and ABH, since officers were highly visible. Around 50 special police volunteers responded, helping to man potentially volatile situations. Fire crews reported a quiet night. Three Watford fire engines were called to the continuing Sony warehouse fire in Enfield at about 03.30 that day. Looting continued throughout the early hours within the Tandem Centre and Priory retail estates in Merton. Police withdrew after coming under attack from a group of over 100 people. Mothercare, JD Sports and PC World were targeted, with Mothercare and Harveys the victims of arson. Police retook the retail parks approximately 3 hour after their withdrawal. Sporadic looting was reported, with convenience stores in Phipps Bridge and a Betting shop in Mitcham was looted. Beckton: Unspecified trouble at the Gallions Reach shopping centre resulted in multiple road closures. Camden: Crowds gathered at Chalk Farm tube station at 1am. Asians guarded their shops. Police drove back looters in Camden High Street and Chalk Farm Road, Camden. Kilburn and Kingsbury: A Vodafone shop in Kilburn High Road was targeted by looters. Looters also hit jewellery stores in Kilburn and Kingsbury. Holloway scuffles occur in the early hours. Wimbledon: Minor incidents occurred in south Wimbledon, the Wimbledon town centre and a handful of shops in Wimbledon Village. The police eventually dispersed them. Major fires were started in Barking, Battersea, Croydon, Dagenham, Ealing, Greenwich and Southwark. Croydon: Local scuffles were quickly dispersed. Camberwell: A small fire was started by arsonists. Islington: The police in Islington appealed for people to stay at home and for shops to close early. Hammersmith and Fulham Hammersmith and Fulham Council urged people to keep calm and stay indoors. Wembley: A police officer was run over by looters at approximately 2:50 am. Three people were arrested for attempted murder. Manchester: The reported riot was an Internet hoax, since it was only a quickly dispersed scuffle. Salford: The reported riot was an Internet hoax; it was only a quickly dispersed scuffle. Brighton: The reported riot was an internet hoax, actually a quickly dispersed scuffle. Derby: Over 20 cars and a local shop were damaged in a series of overnight disturbances in the Campbell Street, Allenton and Brighton Road, Alvaston areas. A pair of 15-year-olds were arrested. Caterham: Traders braced for violent scenes similar to those seen in nearby Croydon. Surrey Police maintained a strong presence to reassure the citizens, but many stores were closed. Shops that specialised in high-value goods such as mobile phones and fine art stayed shut all day. Esquire Fine Menswear on Station Avenue had its windows damaged by hooligans just after 01.30. Southampton: Messages appeared on BBM & Facebook inciting a riot, leading to a few scuffles in Millbrook & Shirley which Hampshire Constabulary broke up. Wolverhampton: Local scuffles were quickly dispersed. Sloane Square: looters smashed the windows of Hugo Boss in Sloane Square. Finchley: A car was torched in Hendon Avenue, Finchley. Harrow: The Metropolitan Police dispersed local riots. Ealing: The Metropolitan Police dispersed local riots. Barnet: The Metropolitan Police dispersed local riots. Surbiton was in a Metropolitan Police and Surrey Police riot lockdown. The shops and cafes were shutting down early on police advice. Bromley: Rioters attacked a sports bar during the morning. Balham: By 13.00, looters had hit the T-Mobile shop and emptied it over a period of 90 minutes. Dartford, Bexley and Bexleyheath: The Bluewater Shopping Centre drafted in extra police officers to deal with the potential threat of rioters. The extra police were from a riot squad. Minor scuffles had hit Bexley early that day. Newham: Gangs of youths looted and vandalised parts of East Ham, including branches of Argos, Primark, Tesco, an electronics shop as well as banks. Stones were being thrown at the Argos shop in Stratford until the police had intervened. The front of Stratford Centre was heavily guarded by police to prevent trouble. Sutton: By 10:01, the entrance to Matalan in Sutton was targeted. An estimated 25 police officers arrived in vans armed with batons and shields in case the situation escalated. West Bromwich: Youths rioted in High Street, looted business, smashing shop windows, and setting bins and cars alight. Police cordoned off the riot zone and some police vans were used to control the mob. Greater Manchester: Both Central Manchester and Salford saw serious looting and disorder, and running battles between gangs and riot police. The fire crews from Richmond and Twickenham helped put out fires in neighbouring boroughs as rioting spread across London. Richmond's red watch was called to Merton where they tackled a blaze at Priory retail estate in Colliers Wood. London: Shops and businesses closed early across the capital after reports of another night of widespread violence. The streets were flooded with 16,000 police officers, with Special Constables requested to report for duty to assist their regular colleagues. A 'Zero tolerance' approach was adopted, and any attempt at disorder was quickly halted. Surbiton: Many shops and restaurants closed early, removed valuables and boarded up their windows on Police advice. Many pubs and restaurants did stay open, but some closed at 22.00. Few problems resulted. Birmingham: Disorderly conduct took place in Birmingham city centre with three people arrested. Some groups tried to break into the Mailbox shopping and office centre and the Pallisades shopping complex. Officers wielding batons eventually dispersed the crowd by charging them, but soon after they gathered again outside a House of Fraser shop, their numbers swelling to around 500. Shortly after 19.00 the mob broke into and looted a nearby Tesco. The police dispersed the 300 strong crowd using a "thunderflash" device,[clarification needed] quickly charging the crowd, but the gangs regrouped and attacked shops, including the Jobcentre in Queen Street and Burton's menswear. A police station in the suburb of Handsworth was also burnt. At around 23.30 the historic Bartons Arms pub in Aston was looted, its windows smashed, and fires started, albeit quickly doused by the landlord. Eleven shots were fired at police who attended the incident, including at a police helicopter and petrol bombs were thrown at officers. Olton: Police quickly dispersed a mob outside a post office in Olton. Coventry: A minor incident occurred in one street in a suburb of Coventry. Wolverhampton: West Midlands Police responded to reports of a large group of people in Wolverhampton city centre after shops were damaged. Birkenhead: Cars were set alight and businesses damaged. Liverpool: 200 rioters hurled missiles at officers in Smithdown Road. Manchester: Riots affected Manchester for the first time. At least one building was set alight. Buses, trams and taxis were stopped from entering the city centre. Looting started in the evening in St. Ann's Square, Market Street, Piccadilly Gardens and Oldham Street. Several shops were looted including a Marks & Spencer food shop, several pawn shops, an Oxfam charity shop and Dawsons Music. A Miss Selfridge shop on Market Street was set alight. Charges against the teenager referred to in the Mail article were later dropped and a 50-year-old man arrested after new evidence was found. The rioters dispersed in the late hours of Tuesday, and rioting did not recur in Manchester. Salford: 80 people confronted police at Salford Precinct. A library was set alight and there was looting. A gang of up to 200 youths raided an off-licence and the main shopping precinct in Salford. The Lidl supermarket on nearby Fitzwarren Street was looted, trashed and set alight by rioters. Banbury: Police dispersed local scuffles. Basildon: About 350 youths smashed shop windows and set fires in Basildon town centre before being dispersed. Fire-fighters were attacked by rioters as they attempted to respond to an incident. Bristol: An event described as an "incident of disobedience" was reported at a young offenders' institution in Ashfield. Cambridge: A group of 30 to 40 youths clashed with police by Midsummer Common and the Grafton Centre. Five arrests were made. Two police officers were treated for minor injuries. Canvey Island: Eleven arson attacks were reported with the targets ranging from rubbish bins to vehicles. Derby: Local scuffles were dispersed . Gloucester: Central Eastgate shopping area, the Argos, HMV and Primark stores were targeted. Just a few hundred yards from Gloucester's famous Norman Cathedral, rioters set fire to a former art college, torched two cars and many rubbish bins. High Wycombe: Police dispersed local scuffles. Huddersfield: An attempt was made to loot an Asda shop. Luton: Rioters threw stones at police officers and started small fires. No arrests were made as the anticipated riots did not take place and the strong police presence prevent any opportunity for disorder. Nottingham: Multiple incidents were reported including attacks on police stations in The Meadows, St Ann's and Canning Circus near Radford. Reading: Police dispersed local scuffles. Southampton: Hampshire Constabulary ordered shops to close early, and placed riot police in Southampton City Center after tweets, BBMs & Facebook messages were discovered inciting a riot. Watford: The Halifax Building Society was among the businesses to close early in case of a riot. A few scuffles took place. Cardiff: police investigated four incidents, including a failed break-in at a branch of the JD Sports chain. Prime Minister David Cameron returned early from his Italian holiday and chaired an emergency meeting of COBR, following the third night of violence. In a statement at 11:00, Cameron announced that 16,000 police officers would be deployed in London, with all police leave cancelled. He announced that Parliament would be recalled on 11 August to debate the situation. Over 525 people had been arrested since the start of the disruption, and the Metropolitan Police have announced their intention to use baton rounds against rioters if necessary. East Ham's Labour MP Stephen Timms and Newham's Mayor Robin Wales praised police for their efforts that day. Officers from the Thames Valley, Essex, Kent, City of London, Norfolk, North Yorkshire, Hertfordshire, Bedfordshire, Surrey and Sussex police constabularies sent officers to help tackle the London riots. By 9 August 2011 563 arrests had been made in London since the start of the disruption, and 100 arrests made in Birmingham. A 16-year-old boy was charged with breach of the peace in connection with a message inciting rioting in Scotland on a social networking site. The boy was detained on the south side of Glasgow about 12.40 over the Facebook page entitled "Let's Start a Riot in Glasgow", which was related to a similar site called "Glasgow Riot FRIDAY 12TH". Both the sites were shuttered. Bristol: Avon and Somerset police arrested 19 people following a second night of minor trouble. Coulsdon: Looters raided GT Shooting's gun shop in Chipstead Valley Road at 08:47. Gloucester saw stone and bottle throwing that morning, but order was quickly restored. Leicester Police officers arrested 13 following disturbances in the city centre. Liverpool: 200 missile-throwing rioters gathered in the south Liverpool area of Toxteth and caused disorder and damage, according to Merseyside police. Scuffles in Edge Hill, and Wavertree were dispersed. Merseyside police said that 35 arrests were made. London: Groups of citizens and shop owners formed in Enfield, Eltham and Southall, in an attempt to prevent looting. A senior police officer said that vigilante groups were hampering police operations. In the evening, police clashed with a bottle-throwing crowd of about 200 vigilantes in Eltham, containing many English Defence League members. Jack England, the EDL's south-east regional organiser, claimed to be combining 50 EDL members with local vigilantes to control the streets. Overnight a small group of men, threw stones and bottles at the police until they were dispersed. Nottingham: A police station and college were firebombed, shops including House of Fraser inside the Victoria Centre where damaged, pubs were damaged and cars and lorries were set fire to. More than 90 people were arrested. The Thames Valley: Thames Valley Police dispersed minor scuffles in Reading, Oxford and Milton Keynes that morning. West Bromwich: Parts of the town centre, and several vehicles, were set on fire. Portsmouth: A nightclub catches fire by South Parade Pier causing the whole esplanade to be shut off. It took the Police 3 hours to put the fire out, the building had to be demolished. To this date it is unknown if this was connected to the riots. Worcester: 50 West Mercia officers were deployed to deal with hooded gangs in Worcester and the surrounding towns of Kidderminster, Redditch and Droitwich. Two cars were set on fire in Worcester. Slough: Shops and leisure facilities - including Absolutely Karting, Absolutely Ten Pin, Absolutely Ice, Montem and Langley leisure centres closed early. The Sainsbury's in Uxbridge Road closed at 10pm rather than 11pm as an anti-looter precaution. The fire brigade confirmed they were put on standby, but nothing happened. The rumours of a major planned riot was just local rumours. St Albans: Arson attack led to the complete destruction of the Batchwood Tennis and Golf Centre. David Cameron chaired another emergency meeting of COBRA, mid-morning. In a statement at 11:05, Cameron announced that plastic bullets were available to the police for use in response to the riots if necessary, and put contingency plans in place to make water cannons available at 24 hours notice. The leader of Hounslow Council, Councillor Jagdish Sharma, urged local residents to "continue to refrain" from taking part in the London riots that had so far not hit the London Borough of Hounslow. The Acting Scotland Yard Commissioner Tim Godwin condemned the "gratuitous" violence by the rioters. The assistant chief constable of Norfolk police, Charlie Hall, slammed people who used Twitter and Facebook to post "fictitious and malicious rumours" that the riots had moved to many to safe, including Norwich. Looters had never struck either in Anglia Square or at PC World. The family of Mark Duggan said they "are not condoning" the riots and looting that rocked north London, that left 26 police officers injured. Local Christians gathered in Derby's Market Place yesterday to hold a prayer meeting to ask for God's help and love towards all those involved in the riots. Persistent heavy rain reduced the numbers of rioters or wandering groups on the streets. By 08:05, police had made more than 1,100 arrests, including 768 in London, 35 in Liverpool, 5 in Milton Keynes, 90 in Nottingham, 13 in Leicester and 19 in Bristol. By 15:00, the police had made 113 arrests in Greater Manchester. Banbury: Arsonists were thought to be responsible for three fires in Banbury, involving a burning car in Waterworks Road near Hennef Way, a fire in a skip to the rear of a house in Bretch Hill and the Pepper Pot in Grimsbury where a recycling bin had been set alight. Dunstable: The Norman King pub, a building in Dunstable, Bedfordshire that dates back to 1109 was destroyed after being set on fire in an arson attack, though police did not link the incident to riots occurring elsewhere in the country, after initial public fears were allayed. Police were praised for their efforts in preventing riots in the Hillingdon. Police manned positions in Uxbridge High Street and Hayes Town. One unspecified crime occurred in the Tesco on Uxbridge Road, Hillingdon town, which was closed and cordoned off by police that morning. Parliament was recalled from its summer recess. This day's debate included the longest question time ever. Cameron told lawmakers there would be no "culture of fear" on Britain's streets, and that the government would consider taking gang-fighting tips from American cities such as Boston. He mentioned former Los Angeles and New York Police Chief Bill Bratton as someone who could offer advice. He said he also wanted to build on the success of programmes to tackle gang culture, such as the task force used by Strathclyde Police. Both Theresa May and Cameron accused the Metropolitan Police service and the West Midlands Police force of being "too few, too slow, too timid" during the rioting in London and the West Midlands county. He said the police on the streets of London were too few and used poor and incorrect tactics when dealing with the rioters. Cameron said that the government, police and intelligence services were looking at whether there should be limits on the use of social media sites such as Twitter and Facebook or services such as BlackBerry Messenger to spread organised disorder, and whether to turn off social networks or stop texting during times of social unrest. The number of arrestees in London rose to 922 and 401 suspects had been charged. The police said they had arrested 330 people over the past four nights. One of the arrested people was an 11-year-old girl from Nottingham. The Prime Minister promised to use the Riot Damages Act, to cover uninsured facilities and buildings and set up a £20,000,000 fund for High Street businesses to use relief following riots. Of more than one thousand people arrested during the three days of troubles in London, about six hundred had been charged by 12 August. The IPCC watchdog admitted that it inadvertently led media to believe shots were exchanged and that Mark Duggan was carrying a gun that was never used. Police forces around England, and especially those in London, Birmingham, Manchester and Nottingham increased their numbers on the streets. Bill Bratton was announced as Cameron's new crime adviser. An estimated 2,000 people joined a vigil in Summerfield Park and laid flowers in memory of officers men who died protecting shops from looters in Winson Green, Birmingham. They were victims of a hit and run attack. Scotland Yard stated that 2,140 people had been arrested, of whom about 1,000 had been charged. The Deputy PM Nick Clegg said that the government would set up an independent "community and victims panel" to look into the riots. He pledged that when an offender who leaves prison from March 2012 they will be met by providers on the Work Programme at the prison gate. A 16-year-old from Hounslow was to be tried for the murder of Richard Mannington Bowes as well as violent disorder and four counts of burglary relating to the looting at a William Hill bookmakers, a Tesco Express, a Blockbuster video shop and a Fatboys restaurant. Martin McRobb, the Crown Advocate for CPS Mersey-Cheshire, read out in Chester court that "Jordan Blackshaw and Perry Sutcliffe independently and from the safety of their homes may have thought that it would be acceptable to set up a Facebook page to incite others to take part in disorders in Cheshire." Cheshire Constabulary had discovered that they used a Facebook group that Blackshaw created to promote the rioting. Blackshaw was from Northwich and Sutcliffe was from Warrington. The Liberal Democrat MP for Bradford East, David Ward, described government plans to withdraw benefits from convicted rioters as "nuts". Cameron defended the scheme. Prince Charles and Camilla, Duchess of Cornwall visited areas of London, including the Tottenham Green Leisure Centre, which was transformed into an aid centre in the aftermath of the rioting. Jae-Kiel Van Eda, 28, was arrested after participating in an act in which 2 constables were hit by a green Citroen while they were dealing with reports of a group looting a clothes shop in Waltham Forest, north-east London on 8 August. One officer suffered knee and leg injuries and the other shoulder injuries. As of 31 August, a total 2,987 were arrested and an estimated £100m of damage recorded in 93 shops and other premises. ^ "England riots: Maps and timeline". BBC News. Retrieved 11 August 2011. ^ Rogers, Simon (7 August 2011). "UK riots: the key facts and figures". The Guardian. UK. Retrieved 11 August 2011. ^ Payne, Sebastian (9 August 2011). "London riots: all incidents mapped in London and around the UK". The Daily Telegraph. UK. Retrieved 11 August 2011. ^ Adams, Richard; Wells, Matt; Jones, Sam; Owen, Paul (9 August 2011). "A young man shot in his car". The Guardian. UK. Retrieved 9 August 2011. ^ "Three killed protecting property during Birmingham riots". BBC News. 10 August 2011. Retrieved 10 August 2011. ^ a b c "Police, pollies in war of words over riots". The Sydney Morning Herald. 13 August 2011. Retrieved 13 August 2011. ^ Milmo, Cahal (10 August 2011). "The night that rioters ruled and police lost control of the streets of London". The Independent. UK. Retrieved 10 August 2011. ^ "London riots 2011: Man beaten in Ealing fighting for life but no one knows who he is | Mail Online". Daily Mail. UK. 11 August 2011. Retrieved 10 August 2011. ^ "Britain's rioters count cost of unrest as order restored". CNN. 12 August 2011. Retrieved 12 August 2011. ^ "Live Updates From Sky News Team And Twitter: Riots Spread Across London | UK News | Sky News". News.sky.com. Retrieved 11 August 2011. ^ Wilson, Peter (11 August 2011). "Police warning on vigilante justice after English riots | The Australian". The Australian. Retrieved 11 August 2011. ^ "UK shaken by worst riots in decades (From Hounslow And Brentford Times)". Hounslowandbrentfordtimes.co.uk. 9 August 2011. Archived from the original on 12 April 2012. Retrieved 20 August 2011. ^ a b Bolesworth, Sarah; Barry Neild; Peter Beaumont; Paul Lewis; Sandra Laville (7 August 2011). "Tottenham in flames as riot follows protest". The Observer. London. Retrieved 7 August 2011. ^ a b "Tottenham in flames as protesters riot". The Guardian. London. 6 August 2011. Retrieved 6 August 2011. ^ "Tottenham police shooting: Dead man was minicab passenger". BBC News. 5 August 2011. Retrieved 7 August 2011. ^ "Tottenham riots are a disgrace, says MP". Channel4.com. Retrieved 7 August 2011. ^ a b c "Eight officers hurt as riots erupt". Harrow Observer. 7 August 2011. Retrieved 20 August 2011. ^ a b c d Lewis, Paul (7 August 2011). "Tottenham riots: a peaceful protest, then suddenly all hell broke loose". The Guardian. London. Retrieved 7 August 2011. ^ Laville, Sandra (7 August 2011). "Tottenham riot: 'very volatile' situation contained, for now". The Guardian. London. Retrieved 7 August 2011. ^ "BBC satellite truck damaged in riots". BBC News. 7 August 2011. Retrieved 7 August 2011. ^ a b Gallagher, Ian; Steve Farrell (7 August 2011). "Did rock-throwing teenage girl's 'beating' by police spark London riots? Pictures that show how Tottenham turned into a war zone". Daily Mail. London. Retrieved 12 August 2011. ^ a b Lewis, Paul (7 August 2011). "Trouble spreads to Enfield – and this time it was organised". The Guardian. London. Retrieved 8 August 2011. ^ "Heavy police presence in Enfield Town Centre, but no rioting". Enfield Independent. Retrieved 7 August 2011. ^ a b "Tension builds in Enfield Town as small groups arrive in area". Enfield Independent. Retrieved 7 August 2011. ^ "Police car trashed by Enfield Town rioters". Enfield Independent. Retrieved 7 August 2011. ^ a b "Clashes between rioters and police in Enfield Town (From Enfield Independent)". The Independent. UK. Retrieved 8 August 2011. ^ Hardiman, David (7 August 2011). "Shops targeted by rioters in Enfield Town, says witness". Enfield Independent. London. Retrieved 8 August 2011. ^ a b c d e f g Gabbatt, Adam (8 August 2011). "London riots: the third night – live coverage". The Guardian. ^ a b c d "Theresa May returns to UK as London riots spread – Channel 4 News". Channel4.com. Retrieved 8 August 2011. ^ "Brixton looting: Video shows unrest". London 24. ^ Ward, Victoria (8 August 2011). "Brixton riots: looters hit Currys, Foot Locker and Halfords". The Daily Telegraph. London. Retrieved 8 August 2011. ^ a b "Looters cause chaos in Streatham and Brixton". Yourlocalguardian.co.uk. Retrieved 8 August 2011. ^ "UPDATE: Lambeth Council leader "They were looters not rioters". (From Streatham Guardian)". Streathamguardian.co.uk. Archived from the original on 30 September 2011. Retrieved 8 August 2011. ^ "Riots, fires break out in North London". MSNBC. 7 August 2011. Retrieved 7 August 2011. ^ Lewis, Paul (7 August 2011). "Tottenham riot: Sustained looting follows night of violence". The Guardian. London. Retrieved 7 August 2011. ^ a b "Police lose control of streets shop owners form local "protection units"". The London Daily News. 7 August 2011. Archived from the original on 4 October 2011. Retrieved 7 August 2011. ^ a b "Jewellers targeted in London riots – Watch News". Watchshop.com. Retrieved 8 August 2011. ^ a b c Lydall, Ross (8 August 2011). "Mob rule in the capital". The Evening Standard. Retrieved 8 August 2011. ^ Jones, Sam; Wells, Matt (8 August 2011). "London riots – Monday's events as they happened". The Guardian. UK. ^ AP (8 August 2011). "News / International : Police arrest 160 people for London riots". Chennai, India: The Hindu. Retrieved 8 August 2011. ^ a b Courtney, Adam (9 August 2011). "Nine arrests as violence spreads to Fulham – Local News – News". Fulham Chronicle. Retrieved 11 August 2011. ^ a b "Pictures of the destruction on Woolwich streets following a night of violence and looting (From News Shopper)". Newsshopper.co.uk. 9 August 2011. Retrieved 20 August 2011. ^ a b "Video: Sky's Mark Stone Speaks With Woolwich Locals Ben Bailey, Danny Mercer And Thomas Hill - Sky News Video Player". News.sky.com. 15 August 2011. Retrieved 20 August 2011. ^ Whittle, Peter (September 2011). "How Liberals And Looters Trashed My Town". Standpoint. Retrieved 23 October 2017. ^ "Cheshunt & Waltham News | Arrests after Waltham Cross riots". Hertfordshiremercury.co.uk. Retrieved 9 August 2011. ^ "Tottenham Riots cause Hackney One Carnival and Parks for Life Festival in Clissold to be cancelled". Stoke Newington People. Retrieved 20 August 2011. ^ "London riots: Met Police launch major investigation". BBC. 7 August 2011. ^ a b "'Community involvement' stopped riots in Brent says MP". Harrow Observer. 9 August 2011. Retrieved 20 August 2011. ^ "Rioting spreads to south London in Streatham and Brixton (From Your Local Guardian)". Yourlocalguardian.co.uk. Retrieved 8 August 2011. ^ Dodd, Vikram (9 August 2011). "London boroughs on alert after third night of violence". The Guardian. UK. ^ a b c d e f g h i j k Lydall, Ross (9 August 2011). "Shock and anger as city awakes to worst scenes since the Blitz". Evening Standard. Archived from the original on 9 December 2012. Retrieved 9 August 2011. ^ Morgan, Tom; Kershaw, Alison (9 August 2011). "Family's Croydon furniture [shop] destroyed in riots". The Independent. UK. Retrieved 9 August 2011. "LIVE UPDATES: Riot fallout hits south London, Croydon (From This Is Local London)". Thisislocallondon.co.uk. Retrieved 8 August 2011. ^ "BBC News – London riots". BBC. Retrieved 8 August 2011. ^ "Home Secretary condemns rioting". The Independent. London. 8 August 2011. Retrieved 8 August 2011. ^ "Reporter attacked during riots tells of 'darkest day' - Journalism News from". HoldtheFrontPage. 12 August 2011. Retrieved 20 August 2011. ^ "Suspected looter shot dead in Croydon named as man from Brixton". Croydon Guardian. 11 August 2011. Archived from the original on 17 October 2013. Retrieved 8 March 2013. ^ Williamson, Hannah (27 June 2012). "Murdered man would not have died had he not been at riots, say police". Croydon Guardian. Retrieved 8 March 2013. ^ "Trevor Ellis riot murder: Reward offered". BBC News. 8 August 2012. Retrieved 8 March 2013. ^ "All of Croydon's public order officers deployed elsewhere in London on night of riots, report findsdate=8 August 2012". Croydon Advertiser. Retrieved 28 February 2012. ^ a b Bradbury, Poppy (8 August 2011). "Police lockdown Ealing Broadway after cars and buses set on fire". Ealing Gazette. Retrieved 9 August 2011. ^ Bax, Steve (9 August 2011). "Ealing reporter attacked during night of violence". Ealing Gazette. Retrieved 9 August 2011. ^ "Ealing riots: A timeline of the violence and looting". Metro. 9 August 2011. Retrieved 9 August 2011. ^ a b Randhawa, Kiran (9 August 2011). "Marauding gangs used chaos as cover for housebreaking | News". The Evening Standard. London. Retrieved 9 August 2011. ^ a b "Owner of looted shop slams police". The Independent. London: INM. 9 August 2011. ISSN 0951-9467. OCLC 185201487. Retrieved 9 August 2011. ^ Degun, Gurjit (9 August 2011). "Riots: Customers come to the rescue of Ealing pub". Morning Advertiser. Retrieved 9 August 2011. ^ Conti, Juan Pablo (9 August 2011). "Britain's entertainment industry not immune to riots". Rapid TV News. Retrieved 9 August 2011. ^ Martin Robinson; Rebecca Camber; Rebecca Evans (14 March 2012). "The bad-boy 'gangsta' poses of teenage thug who killed pensioner with one punch in last summer's riots then carried on looting". Daily Mail. Retrieved 12 August 2013. ^ Hardiman, David. Massive fire at Enfield warehouse in Solar Way. Enfield Independent. Accessed 9 August 2011. ^ a b "Watford crews tackle London riot blaze (From Watford Observer)". Watfordobserver.co.uk. 9 August 2011. Retrieved 20 August 2011. ^ a b "Battersea businesses begin to assess riot damage". The Guardian. UK. 9 August 2011. Retrieved 11 August 2011. ^ Wardrop, Murray (10 August 2011). "London riots: YouTube crime victim a Malaysian student". The Daily Telegraph. UK. Retrieved 10 August 2011. ^ a b c d "London riots spiral out of control". Belfast Telegraph. Belfast. 8 August 2011. Retrieved 9 August 2011. ^ "Witness saw police chase 60-strong group through Mays Lane, Barnet (From Times Series)". Times-series.co.uk. Retrieved 9 August 2011. ^ Wallace, Sam (9 August 2011). "FA to follow police advice over England game – International, Football". The Independent. UK. Retrieved 9 August 2011. ^ Bryant, Miranda (9 August 2011). "I left Paris because it wasn't safe... now this is a war zone". Evening Standard. Retrieved 10 August 2011. ^ "Riot chaos reaches Bayswater". Westminster Chronicle. UK. 9 August 2011. Retrieved 9 August 2011. ^ "Shops looted along Queensway in Bayswater - London". Demotix. UK. 8 August 2011. Retrieved 8 August 2011. ^ Rogersa, Simon (10 August 2011). "UK riots: every verified incident. Download the full list | News". London: guardian.co.uk. Retrieved 20 August 2011. ^ a b c "Riot police patrol Bluewater". Kentonline.co.uk. Retrieved 10 August 2011. ^ "UPDATES: Bromley riots (From This Is Local London)". Thisislocallondon.co.uk. 8 August 2011. Retrieved 20 August 2011. ^ a b "The riot on our doorstep | ChislehurstNews". Chislehurstnews.wordpress.com. Retrieved 20 August 2011. ^ "UPDATE: Riots spread to Colliers Wood Tandem shopping centre (From Your Local Guardian)". Yourlocalguardian.co.uk. Retrieved 11 August 2011. ^ "LIVE UPDATES: Riot fallout hits south London, Croydon (From Your Local Guardian)". Yourlocalguardian.co.uk. Retrieved 11 August 2011. ^ a b c d "HOW THE RIOTS HIT – AREA BY AREA". Southwark News. 10 August 2011. Retrieved 11 August 2011. ^ a b c Courtney, Adam (8 August 2011). "Nine arrests as violence spreads to Fulham". Fulham and Hammersmith Chronicle. Retrieved 11 August 2011. ^ "London riots: Violence erupts for third day". BBC. 9 August 2011. ^ "Looters target Harlesden pawnbrokers - Crime". London 24. Retrieved 20 August 2011. ^ "Harlesden traders attacked as looters attempt to storm their shops". Willesden & Brent Times. ^ Hounslow borough residents remain calm despite London riots. "Hounslow borough residents remain calm despite London riots - Communities - Feltham, Bedfont & Hanworth". Feltham.hounslowchronicle.co.uk. Retrieved 20 August 2011. ^ "Looting in Ilford as violence spreads". Ilford Recorder. 9 August 2011. Retrieved 10 August 2011. ^ "Rumours of Kingston riot unfounded (From Surrey Comet)". Surreycomet.co.uk. 9 August 2011. Retrieved 26 September 2011. ^ "More Violence In London And Now Birmingham". Sky. ^ "Looters attack diners at Michelin-starred Ledbury". London Evening Standard. UK. 9 August 2011. ^ "Shops close in Sutton amid rumours of disturbances". Sutton Guardian. 9 August 2011. Retrieved 9 August 2011. ^ "Tooting stores targeted in copycat riots". Your Local Guardian. 8 August 2011. ^ a b c d "London riots: Havering gangs scuppered by high police presence - Crime". London 24. Retrieved 20 August 2011. ^ a b Soteriou, Marina (8 August 2011). "Woolwich riots: pub, bank and police car on fire". Bexley Times. Retrieved 9 August 2011. ^ Soteriou, Marina (9 August 2011). "London riots: the aftermath in Woolwich". Bexley Times. Retrieved 9 August 2011. Virtue, Rob (9 August 2011). "Woolwich stunned after night of rioting". The Wharf. Retrieved 9 August 2011. ^ "Police arrest 87 as rioting and looting erupts in Birmingham". BBC News. 9 August 2011. Retrieved 9 August 2011. ^ "Riots erupt in Birmingham: Police make 130 arrests". BBC Online. 9 August 2011. Retrieved 9 August 2011. 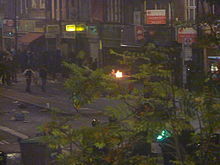 ^ a b "UK riots: Second night of unrest in Midlands". BBC. 9 August 2011. ^ a b c Published on Tue 9 Aug 09:40:21 BST 2011 (9 August 2011). "Police response to Bedfordshire riot rumours - News". Bedford Today. Retrieved 26 September 2011. ^ "Hertfordshire and Bedfordshire police forces help Met tackle London riots - News". The Comet. Retrieved 26 September 2011. ^ "PM: 16,000 police to tackle riots". Harrow Observer. 9 August 2011. Retrieved 9 August 2011. ^ a b PM David Cameron returning as London riots spread to Birmingham, Liverpool and Bristol. Belfast Telegraph. Accessed 9 August 2011. ^ "London riots spread to Bristol as 150 people clash with police in city centre". Bristol Evening Post. 9 August 2011. Retrieved 10 August 2011. ^ "No riots in Guildford last night; some local businesses affected by unrest in London". Guildford People. Retrieved 20 August 2011. ^ "Chapeltown shooting: Police tackle 'pockets of disorder'". BBC News. 9 August 2011. Retrieved 13 August 2011. ^ "Police deal with disorder in Liverpool". BBC News. 9 August 2010. Retrieved 9 August 2011. ^ "Medway Riots". Mikerussellradio.com. Retrieved 20 August 2011. ^ "UK RIOTS LATEST: Norwich shops shut early as police take precautionary steps - Crime - Eastern Daily Press". Edp24.co.uk. Retrieved 20 August 2011. ^ Oxford Macdonalds was set on fire as was a car in the area. ^ "Croydon Council tells possible looters to stay away (From Your Local Guardian)". Yourlocalguardian.co.uk. Retrieved 11 August 2011. ^ Published on Mon 08 19 Aug:02:04 BST 2011. "Clegg tours riot-hit community - National". Banbury Guardian. Retrieved 20 August 2011. ^ "North Yorkshire Police issue a statement on the recent riots". Harrogate News. 9 August 2011. Retrieved 26 September 2011. ^ "Cached". Times-series.co.uk. Retrieved 1 February 2012. ^ "'Witness' found over Richard Bowes death". BBC. 15 August 2011. ^ "Murder hunt as have-a-go pensioner hero dies". Express.co.uk. 12 August 2011. Retrieved 1 February 2012. ^ Writer, Staff (9 August 2011). "London Riots: Fires Spread on Third Night of Violence". Time Magazine. Retrieved 10 August 2011. ^ Llewellyn Smith, Caspar (9 August 2011). 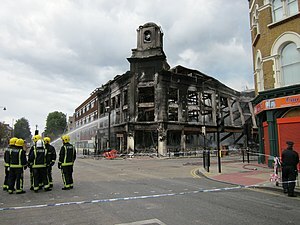 "Independent record labels fear ruinous stock loss in London Riots Fire". The Guardian. UK. Retrieved 9 August 2011. ^ a b "Colliers Wood lootings at the Tandem Centre: the aftermath". Yourlocalguardian.co.uk. Retrieved 9 August 2011. ^ Writer, Staff (9 August 2011). "UK riots: Trouble means more road closures for travellers on journey home". The Daily Mirror. UK. Retrieved 9 August 2011. ^ a b c Paul Lewis & James Harkin (9 August 2011). "Who are the rioters? Young men from poor areas ... but that's not the full story | UK news". London: The Guardian. Retrieved 1 February 2012. ^ "Shops looted as rioters hit Camden Town and Chalk Farm". Camden New Journal. Retrieved 9 August 2011. Hodgkinson, David. "Aftermath of Camden riots – London". Demotix.com. Retrieved 9 August 2011. ^ "Looters strike in Kilburn and Kingsbury - Crime". London 24. Retrieved 20 August 2011. "Brent News". London 24. 16 November 2010. Retrieved 20 August 2011. ^ a b c d e f g h i "London riots update: Wolverhampton trouble, but Manchester & Brighton calm #londonriots « 100gf | Politics and Computers". 100gf.wordpress.com. Retrieved 20 August 2011. ^ "Looters mow down police officer in Wembley". Willesden & Brent Times. ^ "Today's Best Mix for North Derbyshire - Music / News /Sport/ Traffic - News". Peak FM. 2 September 2010. Retrieved 26 September 2011. ^ "Riots: Six arrested in Derby after cars damaged". BBC. 11 August 2011. ^ "Riot copycat gang pay price for night of terror". Northampton News. 8 August 2011. ^ a b "Surrey businesses on alert after London riots - News". getsurrey. 9 August 2011. Retrieved 26 September 2011. ^ a b "Richmond police urge vigilance after further night's rioting (From Richmond and Twickenham Times)". Richmondandtwickenhamtimes.co.uk. 9 August 2011. Retrieved 1 February 2012. ^ a b c d "The latest news as it happens on riots in the city (From Enfield Independent)". Enfieldindependent.co.uk. 11 August 2011. Retrieved 20 August 2011. ^ "The latest news as it happens on riots in the city (From This Is Local London)". Thisislocallondon.co.uk. 11 August 2011. Retrieved 20 August 2011. ^ "Surbiton Riot Lockdown". Surbiton People. Retrieved 20 August 2011. ^ "Aussies caught up in frenzy of London riots". Herald Sun. 9 August 2011. Retrieved 9 August 2011. ^ "RIOT LATEST: Looting and violence hit Balham (From Your Local Guardian)". Yourlocalguardian.co.uk. Retrieved 11 August 2011. ^ a b c Grainger, Colin (9 August 2011). "Damage on the streets of Newham in copy-cat attacks". London 24. Retrieved 10 August 2011. ^ "Sutton police ready to stop looting (From Your Local Guardian)". Yourlocalguardian.co.uk. Retrieved 11 August 2011. ^ James Carpenter's film recommendation (10 August 2011). "Riots in West Bromwich « Express & Star". Expressandstar.com. Retrieved 20 August 2011. James Carpenter's film recommendation (10 August 2011). "Riots in West Bromwich « Express & Star". Expressandstar.com. Retrieved 20 August 2011. ^ a b c d e f g h i j Sam Jones, Helen Clifton & Martin Wainwright (8 July 2011). "UK riots: London violence spreads to cities across England | UK news | guardian.co.uk". Guardian. UK. Retrieved 10 August 2011. ^ "Firecrews from Richmond and Twickenham helped riot hit neighbouring boroughs (From Richmond and Twickenham Times)". Richmondandtwickenhamtimes.co.uk. 9 August 2011. Retrieved 20 August 2011. ^ "Riot latest Twitter lies caused panic in Sutton (From Your Local Guardian)". Yourlocalguardian.co.uk. Retrieved 11 August 2011. ^ Update on disorder in West Midlands – Tuesday 9 August 7.45pm. West Midlands Police. Accessed 9 August 2011. ^ a b Wainwright, Martin; Laville, Sandra; Walker, Peter; Vasagar, Jeevan (8 July 2011). "UK riots: disorder spreads to Manchester and West Midlands | UK news". The Guardian. UK. Retrieved 10 August 2011. ^ Britten, Nick (31 May 2011). "UK riots: fear in the air in Birmingham as mobs roam streets". London: Telegraph. Retrieved 10 August 2011. ^ Farncombe, Vicky (13 August 2011). "Birmingham Riots: Night of terror for Barton Arms managers". Birmingham Mail. Retrieved 17 August 2011. ^ "Footage released after shots fired at police in Birmingham disorder - Appeal". West Midlands Police. 20 August 2011. Archived from the original on 28 July 2014. Retrieved 20 August 2011. ^ Stone, Emma (11 August 2011). "Petrol bombs thrown at police as rioting spreads to streets of Coventry". Coventry Telegraph. Retrieved 11 August 2011. ^ "Police warn public to stay away from Birkenhead town centre as rioting escalates". Wirral Globe. 10 August 2011. Retrieved 10 August 2011. ^ Quinn, Ben; Adams, Richard (8 September 2011). "London riots and UK unrest: fourth night live updates". The Guardian. Retrieved 8 September 2011. ^ a b "Shops smashed and BBC cameraman attacked in Salford". BBC News. 10 August 2011. Retrieved 9 August 2011. ^ Cooper, Rob (10 August 2011). "Mr Moron torches Miss Selfridge: The moment thug set fire to dress and caused High Street inferno". Daily Mail. London. Retrieved 10 August 2011. ^ Carter, Helen (21 August 2011). "Teenager cleared of setting fire to Miss Selfridge during Manchester riots". The Guardian. London. Retrieved 21 August 2011. ^ a b c d e f Ross, Tim (10 August 2011). "Rioting spreads as mobs hit Gloucester, Cambridge and Cardiff". The Telegraph. London. ^ a b Marden, Gina (10 August 2011). "Updated: Disorder hits south Essex". Essex Echo. ^ "Cambridgeshire Constabulary". Cambs.police.uk. Retrieved 10 August 2011. "Riots Update; Huntingdon & Cambridge". Huntingdon People. Retrieved 20 August 2011. ^ 10th August 2011, 11:53 (10 August 2011). "UPDATED: East Midlands Riots | Local News - Capital East Midlands". Capitalfm.com. Retrieved 20 August 2011. ^ "Wakefield teenager arrested for riot 'invite'". BBC News. 10 August 2011. Retrieved 10 August 2011. ^ "Riots have not spread to Luton". Harpenden People. Retrieved 20 August 2011. ^ "UK police station fire bombed". Nine News. 9 August 2011. Retrieved 9 August 2011. "Three Nottingham police stations attacked by gangs". BBC News. 9 August 2011. Retrieved 9 August 2011. ^ "Undercover reporting of the Watford 'riot' (From Watford Observer)". Watfordobserver.co.uk. 10 August 2011. Retrieved 20 August 2011. ^ Derby Telegraph (9 August 2011). "PM returns as rioting spreads in the capital". This is Derbyshire. Retrieved 20 August 2011. Sparrow, Andrew; Watt, Nicholas (9 August 2011). "David Cameron chairs emergency Cobra meeting after third night of riots". The Guardian. UK. ^ "England riots". BBC. 11 August 2011. Retrieved 9 August 2011. ^ Adams, Richard; Wells, Matt; Jones, Sam; Owen, Paul (9 August 2011). "London and UK riots day three aftermath: live coverage". The Guardian. Police have disclosed that live baton rounds – non-lethal plastic bullets – may be deployed tonight. Deputy Assistant Commissioner Steve Kavanagh of the Metropolitan police told our crime correspondent, Sandra Laville: "If we need to, we will do so." He said 525 people have been arrested since rioting began on Saturday, and about 100 have been charged. ^ "UK RIOTS LATEST: Norfolk police sending officers to London - News - Norwich Advertiser". Norwichadvertiser24.co.uk. Retrieved 20 August 2011. "Hertfordshire and Bedfordshire police forces help Met tackle London riots - News". The Comet. Retrieved 20 August 2011. "Surrey and Sussex officers sent to aid Met Police". BBC. 9 August 2011. Published on Tue 9 Aug 09:40:21 BST 2011 (9 August 2011). "Police response to Bedfordshire riot rumours - News". Bedford Today. Retrieved 20 August 2011. Vikram Dodd & Caroline Davies (8 August 2011). "London riots escalate as police battle for control | UK news". The Guardian. Retrieved 1 February 2012. ^ "UK riots: Trouble erupts in English cities". BBC News. 10 August 2011. Retrieved 10 August 2011. ^ "BBC News – Riots erupt in Birmingham: Police make 130 arrests". BBC. 6 July 2011. Retrieved 9 August 2011. ^ "Scottish youths arrested over Facebook 'riot' messages". BBC. 9 August 2011. "London riots: Glasgow teenager detained over Facebook message". The Telegraph. 9 August 2011. Girdwood, Andrew (9 August 2011). "Did Facebook do enough to stop Glasgow riots - or was it the community?". Blog.arhg.net. Retrieved 20 August 2011. "Calls made to close Glasgow riot Facebook page - News - THE DRUM - Advertising, Design, Media, Marketing, Digital, PR - News, Information & Jobs". The Drum. 9 August 2011. Retrieved 20 August 2011. "You helped me stop a potential riot in Glasgow". The Student Room. 9 August 2011. Retrieved 20 August 2011. Taylor, Marianne (16 August 2011). "Why didn't the riots reach Scotland?". The Guardian. London. Carrell, Severin (9 August 2011). "Glasgow boy arrested for 'inciting riots' on Facebook". The Guardian. London. "16-year-old boy charged over Facebook post to incite Glasgow riot | Glasgow and West | STV News". News.stv.tv. 9 August 2011. Retrieved 20 August 2011. ^ "Looters raid gun shop in Coulsdon". Your Local Guardian. 10 August 2011. Retrieved 11 August 2011. ^ Jones, Sam; Meikle, James (10 August 2011). "UK riots: More than 1,000 arrests strain legal system to the limit". The Guardian. UK. ^ Hough, Andrew (31 May 2011). "London riots: vigilantes hurl bottles at police in Eltham". Telegraph. Retrieved 11 August 2011. ^ "Video: London riots: far-right political party 'protect' Eltham residents". Telegraph. 10 August 2011. Retrieved 11 August 2011. ^ "Videos: News, Sports, Entertainment, Technology & More". USA Today. 25 May 2011. Retrieved 11 August 2011. ^ "British prime minister vows 'no culture of fear' on streets". USA Today. 11 August 2011. Retrieved 11 August 2011. ^ "Hotel and flats evacuated in Southsea seafront fire". BBC News. 10 August 2011. ^ "Two cars torched and 12 arrested in Worcestershire". BBC News. 10 August 2011. ^ "Shops shut early over Slough riot fears". Maidenhead-advertiser.co.uk. Retrieved 26 September 2011. ^ "Four arrested on suspicion of arson following St Albans sports centre fire". Herts Advertiser. Retrieved 5 November 2015. ^ Watt, Nicholas (9 August 2011). "David Cameron to convene second Cobra meeting on London riots". The Guardian. UK. Retrieved 10 August 2011. ^ Hounslow Council leader issues London riots statement. "Hounslow Council leader issues London riots statement - Communities - Hounslow". Hounslow.hounslowchronicle.co.uk. Retrieved 20 August 2011. ^ a b "Bedfordshire Local News, Local News Headlines in Bedford | Bedfordshire Newspaper Online | Victim's family condemns rioting". Bedfordshire-news.co.uk. Retrieved 20 August 2011. ^ "UK RIOT LATEST: Norfolk police blast riot rumours - News - Norwich Evening News". Eveningnews24.co.uk. Retrieved 20 August 2011. ^ "City prayer vigil for riot victims". This is Derbyshire. 10 August 2011. Retrieved 26 September 2011. ^ "BBC News – Hundreds join Manchester clean-up after riots". BBC. 10 August 2011. Retrieved 11 August 2011. ^ "Aftermath of blaze at town centre pub". Dunstable Today. 11 August 2011. Retrieved 12 August 2011. ^ "Police praised for preventing riots in Hillingdon". Uxbridge Gazette. 11 August 2009. Retrieved 12 August 2011. ^ Sparrow, Andrew (9 August 2011). "David Cameron announces recall of parliament over riots". The Guardian. London. ^ a b c "UK riots: David Cameron turns spotlight on tackling gang culture". Daily Mirror. UK. 9 August 2011. Retrieved 11 August 2011. ^ "BBC News – England riots: Government mulls social media controls". BBC. 11 August 2011. Retrieved 11 August 2011. ^ Watt, Nicholas; Laville, Sandra; Dodd, Vikram (11 August 2011). "Tories on riot policing: too few, too slow, too timid". The Guardian. London. ^ "England riots: Cameron says police admit to wrong tactics". BBC. 11 August 2011. ^ Ranger, Steve. "Prime Minister: Do we need social media bans for rioters? | Public Sector". silicon.com. Retrieved 11 August 2011. ^ Anderson, Ash. "Government Control of Social Media. Are You Prepared?". keynoodle.com/government-control-of-social-media-are-you-prepared/. ^ Alleyne, Richard (11 August 2011). "UK riots: 11-year-old girl held over Nottingham damage". The Telegraph. London. ^ "Businesses to get rate relief following riots Guildford, Petersfield | Antrobus Chartered Accountants". Antrobus.biz. 22 April 2009. Retrieved 26 September 2011. ^ "London riots: More than 1,000 arrested over disorder". BBC. 12 August 2011. Retrieved 26 August 2011. ^ Lewis, Paul; Laville, Sandra (12 August 2011). "Mark Duggan death: IPCC says it inadvertently misled media". The Guardian. London. ^ Hall, Richard (13 August 2011). "Show of force to deter Saturday night trouble". The Independent. London. ^ "UK Police Body Questions PM's Need For US Cop". Sky. ^ Topping, Alexandra (14 August 2011). "Birmingham mourns its riot dead as three men face charges". The Guardian. London. ^ "Riot police frustrated by mixed messages". The Sydney Morning Herald. 15 August 2011. ^ Rigby, Elizabeth (16 August 2011). "Clegg unveils panel to investigate riots". FT.com. Retrieved 26 September 2011. ^ "Boy, 16, in court over riot murder - UK News - News". WalesOnline. 16 August 2011. Retrieved 26 September 2011. ^ Wardrop, Murray (17 August 2011). "England riots: Liberal Democrats and campaigners condemn 'bonkers' sentences". The Telegraph. London. ^ "PM defends Facebook jail term". Sky. ^ Harrison, Paul. "Royals Visit Riot-Hit Areas Of London". Sky. ^ James Carpenter's week (20 August 2011). "Birmingham riot gunmen video footage released « Express & Star". Expressandstar.com. Retrieved 26 September 2011. "Rioters who shot at police will be treated as attempted murderers". AP. Associated Press. 20 August 2011. Savvas, Christina (20 August 2011). "Birmingham riots: Police overwhelmed at support from public". Birmingham Mail. "West Midlands police release new Birmingham riot images". BBC. 20 August 2011. "Police: Footage reveals hooded rioters firing at officers". CNN. 9 August 2011. ^ "Man, 28, Charged After Two Police Officers Were Run Over During The Recent London Riots | UK News | Sky News". News.sky.com. Retrieved 1 February 2012. ^ Rogers, Simon (19 August 2011). "UK riots: the key facts and figures | News | guardian.co.uk". London: Guardian. Retrieved 1 February 2012.